I don’t make pie crust often – it’s just RancherMan & me in our empty-nest home these days and making pie is something I typically only make for larger gatherings a few times a year. But occasionally I’ll need to make a pie crust for things other than a pie, like recently I made a homemade Chicken Pot Pie and I needed crust for that (it was delicious by the way) and even more recently while the grandbabies were visiting I made some baked Apple Hand-Pies (little apple pies you can eat with one hand – kinda like fried pies) and of course I needed the crust for that as well. Thankfully this recipe makes a delicious flaky crust in no time. To make the crust I measured out 2 cups of flour and added 1 teaspoon of salt and mixed it together. Then I added 2/3 cup shortening and mixed it all together until it was all crumbly. Some people use a pastry cutter to complete this task but I always just use freshly washed & dried hands to get the mixture just right in a snap. Then lastly I added 6 Tablespoons of water and mixed it all in until it looked like a dough ball. I usually start out this step with a fork and then finish up with freshly-washed hands. So there ya go – Easy Peasy! My recipe is below. Mix flour and salt in a large bowl. Cut in shortening until mixture is completely blended and appears crumbly. Add water and mix thoroughly with clean hands. Dough will form into a ball when it's adequately mixed. The dough will be sticky and tough if too much water is added, and it will crack and tear when rolled if too little is added. Only if needed add additional water in just 1-Tablespoon increments. Cut dough in half and roll each half out for your 9" pie crust. This entry was posted in Blog Posts and tagged Cooking, Frugality, Make-It-Yourself, Recipes on August 16, 2015 by Texas Homesteader. *Slaps forehead! * Never thought of broth in my crust for savory pies, Miz Taylor! Such a GOOD idea!!!! There is nothing like a pie to warm the heart. And this crust recipe is the start to a perfect pie. Pinning and sharing. Awesome! I may have to use this recipe and make some chicken pot pie! Thanks for sharing on the Waste Less Wednesday Hop! 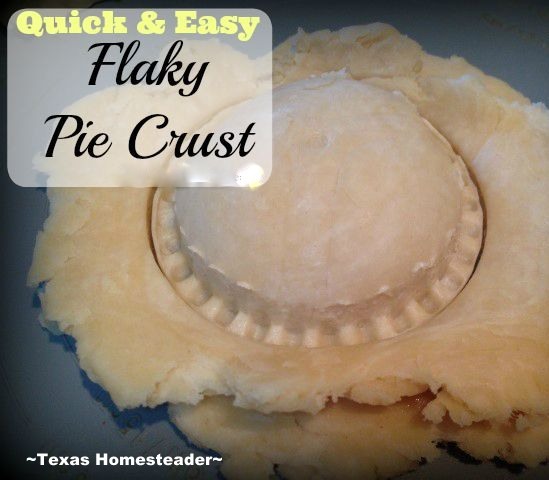 This is just like mine – nothing better than fresh pie crust! Thanks for sharing on Homestead Blog Hop! Thanks for sharing on the Whats for Dinner link up! Looks easy to me!! Thanks for sharing on the What’s for Dinner link up and don’t forget to leave a comment at the party – Next week’s features that also leave a comment get pinned and tweeted! I have had the worst luck this month with my pie dough! Why do you use shortening instead of butter? Thanks! For me, pie season is coming up now with fall and I love having a warm pie on a sunday afternoon, but my pie crusts never really turn out great! Will try your recipe for sure!! Can’t wait to try! I’ve been searching for a good pie crust! Thanks for sharing on the Homesteader Hop! Simple pinning for later. Thanks for sharing on the Homestead Blog Hop. I needed a good pie crust recipe!! Thanks for sharing on My 2 Favorite Things on Thursday! Hope to see you again this week! Pinned! Easy and quick is my motto. My mom always made pie crusts using lard. Me, I sue Crisco in place of lard.